Most of you will of seen films like Homeward Bound! and Lassie Come Home! Where animals have been separated by they owners and they make an incredible long journey back home! These stories are just Fiction not Fact! Well for Chilcotin Holidays this became reality when we lost two horses out in the Mountains last October, the mountain guides had spent days looking for these horses and had no such look,knowing that the snow was falling really heavy they new they would have to leave the mountains and return to the ranch otherwise they would have been stuck up there as well. 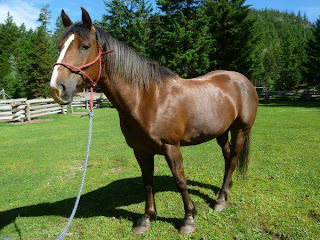 We had been hoping all winter that these horses would join forces with the Wild Horse herds of the Chilcotin Mountains knowing that they would be safe with them. Meg and Liza had spent 8 months out in the mountains fighting off Wolf packs and Cougar travelling over steep ridges, through Meadows and along the Creeks to find they rightful place. On the 28th of June Meg and Liza walked up the drive into the ranch to be greeted by their mountain guides that spent days in the Mountains looking for them.